snap calling with 3-4 off? doesn't make sense to me but whatever. I get that he's a whiner, but not a donk. Calling a 9bb shove by the BB with a pocket pair is not donkish. In his case it was just unfortunate bad timing. 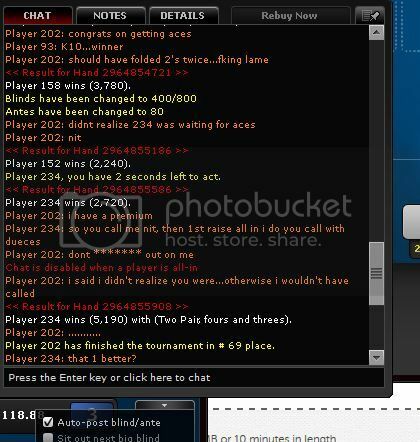 Your call of most of your stack with the 3-4 with 70 players left in the tourney was, maybe arguably, pretty donkish, but I understand that you let your emotions get the better of you based on the convo you were having with 202.